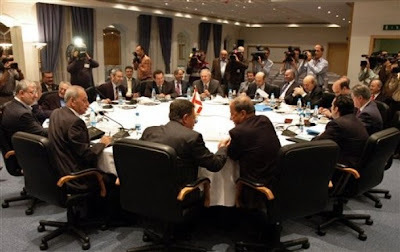 Just imagine the Lebanese Council of Ministers meetings in a Reality TV Show Format. A compromise between ‘Big Brother’ and ‘Star Academy’ that could run all the way until the 2009 elections. Except for the female eye candy, all the ingredients are provided for popcorn entertainment. It would be presented by Marcel Ghanem and May Chidiac. A phone-in voting competition would certainly spice things up and increase youth interest in the political process. I say political process because Lebanese youth consider themselve already politicized. They certainly swear allegiance to one or the other faction before they are old enough to have a girlfriend. But you would only consider them politicized if you were also of the view that ‘Rambo’ is a political drama. The audience (18 and above) would vote out the least popular minister at every meeting. President Suleiman would be excluded for fear of damaging his pristine image. The voting pattern would follow confessional lines with Khaled Kabbani securing the majority of the votes in Tarik Jedide and Mohammad Fneish dominating in Dahye. As a consequence the first to go would be representatives of minority sects: The Armenians, the Greek Catholics and Talal Arslan, unless they manage to come up with unlikely popular proposals. Since accountability remains an alien concept in that part of the world, they could propose 24 hour electricity, reduced mobile phone tariffs or reclaiming the Lebanese coast as state property open to all. Once the voting over they would deny having promised anything. Walid Joumblatt would be accused of back stabbing, manipulation and inconsistency to which he would respond by ‘So What...I am only playing the game!’. Elias Murr would maintain a low profile until forced to make his views clear in the Diary Room. Jean Ogassapian would be voted out unintentionally, many majority supporters confusing him with Alain Tabourian. Ali Qanso would be disqualified for threatening to execute his fellow ministers over minor disagreements. 28 weeks later Ziad Baroud would emerge a clear winner as the most popular minister while Jibran Bassil alleges vote-rigging carried out through his ministry.